It's A Dan's World: SWEET AS: The Best From Marvel Comics' May 2014 Solicitations - Original Sin, Shang-Chi Gets A #1 At Last, And A New Look Mysterio? 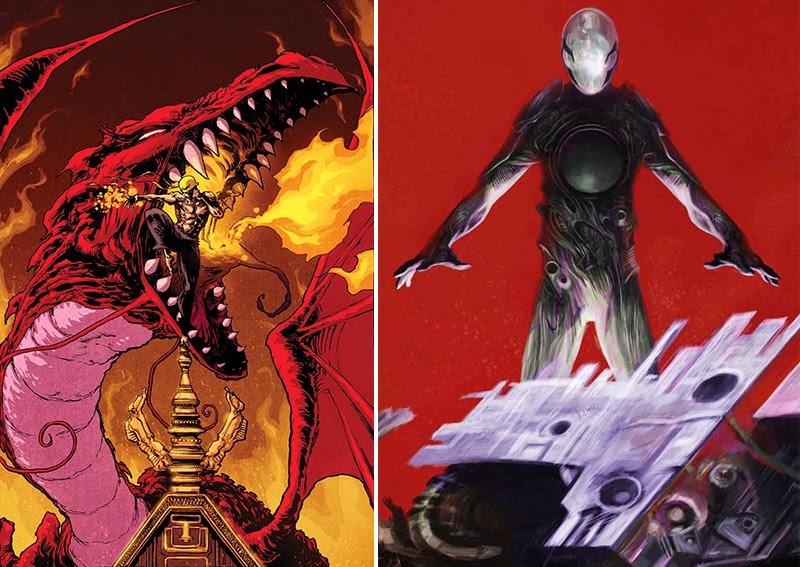 SWEET AS: The Best From Marvel Comics' May 2014 Solicitations - Original Sin, Shang-Chi Gets A #1 At Last, And A New Look Mysterio? Now that is an army. 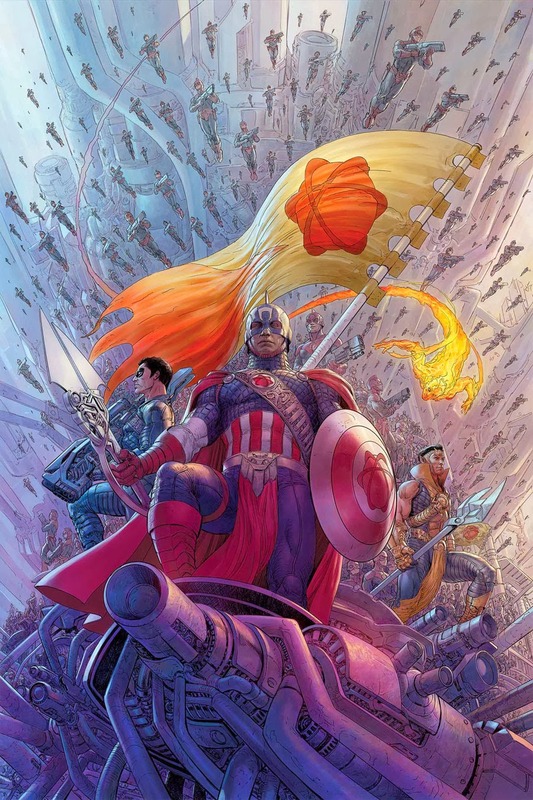 Of course you've got to have Cap at the front, rumor has it he doesn't come out of his trailer for anything less. Could there be a new look Mysterio in the Marvel Universe? From the look at that image then read this solicit information for UNCANNY X-MEN #21 'Who is the mysterious figure building Sentinels for S.H.I.E.L.D.? Find out what happened to Dazzler since Mystique took her down! (W) Brian Michael Bendis (A) Chris Bachalo' - if it is that is one mean as new take on the bowl head! CYCLOPS #1 Cyclops just discovered that the father he thought died long ago is alive and well and a space pirate. The first ongoing solo series for one of the time-traveling Original X-Men, after the events of Trial of Jean Grey, Scott Summers stays in space to learn some valuable lessons from his dad: 1) How to shave, 2) How to talk to girls, 3) How to steal a Badoon space-ship. What do you think? 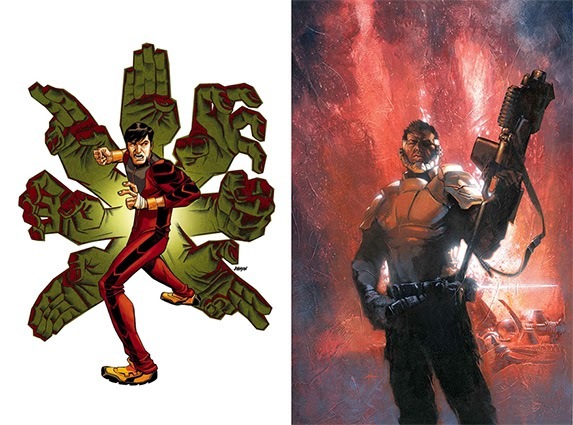 For the full list of Marvel's May 2014 solicitations, click the jump. Whoa just heard thru the grapevine me self of all the exciting stuff in the new FF...seriously stoked for this! !!!!!! Will be interesting seeing how Puppet Master is brought back as a credible threat Karl - that's an interesting one right there. With this and The Invaders, I think Robinson is writing the two most bankable hits at Marvel right now. I saw the Silver Surfer preview in Marvel Plus One and its truly awful. ..kiddie Mike Allred art but the worse things is the cheap Dr Who knock off. ..Surfer flying around with Dawn making silly quips and funny remarks like Matt Smith. You want to know who draws plenty of killer Surfer art Karl? Alex Maleev. The former Spider-Woman artist has sure pumped out a lot of fan art, each as awesome as the last. Hopefully in time he'll get a paid shot at the character, because boy does he deserve one.